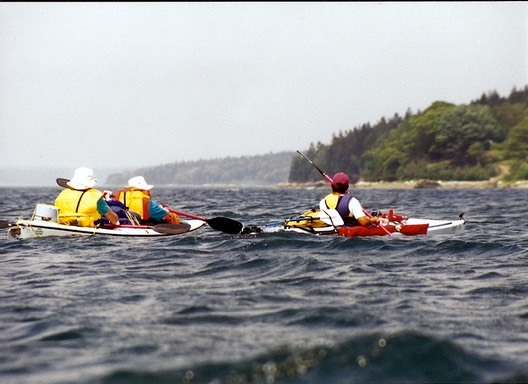 My wife, Lisa and I were looking for a different kind of vacation in 1995, when I stumbled on an advertisement for a three-day wilderness kayaking trip off the coast of Maine. Although we both had spent many years in boats and around water, neither one of us had ever been in a kayak. We decided to give it a try. We arrived at the outfitter’s store in Bar Harbor where we met our young guide and two other paddlers. Hal and Elizabeth appeared to be in their sixty’s, both college professors from the Toronto area in Canada. Unlike Lisa and I, they were experienced paddlers. We soon piled into a van towing two beautiful Wilderness Systems twenty-one foot fiberglass double kayaks and a single for our guide. 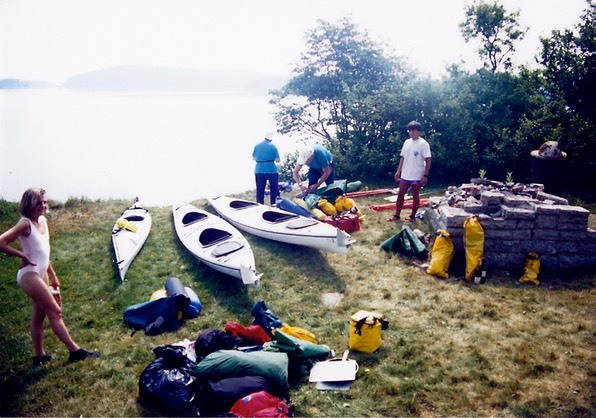 All of our gear for three days unsupported in the Maine Islands was piled in the back. 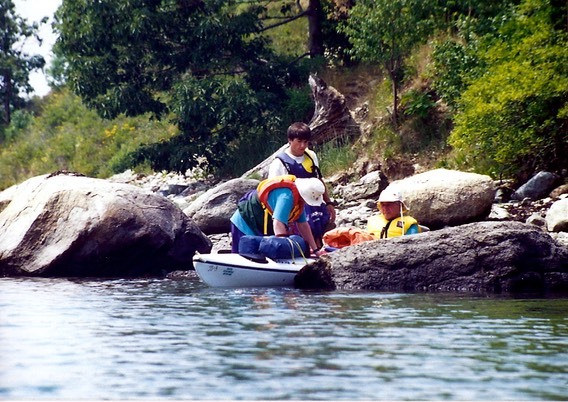 Our launch point was a small beach just east of Castine, home of the Maine Maritime Academy. 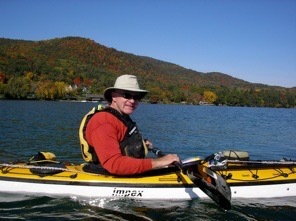 We were to paddle some 35 miles back to Bar Harbor over the next three days. On our arrival at the beach we set about unloading the boats and gear and began the arduous task of packing them for our adventure. The boats have cavernous watertight storage compartments for gear. Still, we had so much stuff to carry that gear was stuffed everywhere. I found that my car camping style sleeping bag was just too big to stuff into a hatch and have any room for other necessary gear. So we wrapped it in several large plastic bags and tied it on deck between the bow and stern paddlers. I had a case with propane cylinders between my legs inside the cockpit. Every inch was used for something. This raised the 88 pound weight of the boats to 125 pounds or more, without us in them. As a result, they were a bear to get on and off of a beach. Next came our (really Lisa’s and my) tutorial on how to paddle the boat. Hal and Elizabeth already knew how to paddle. We watched the demonstrations and tried to apply what we had been shown. 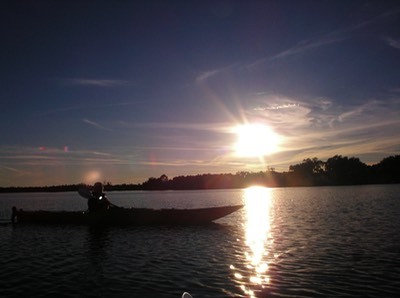 But time on the water would show us how little we knew and how much we had yet to learn. 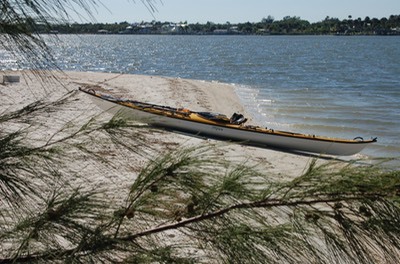 We launched the boats and headed out for our first five or six mile jaunt to a beach for lunch. We were able to make the boat move, but only with great effort. 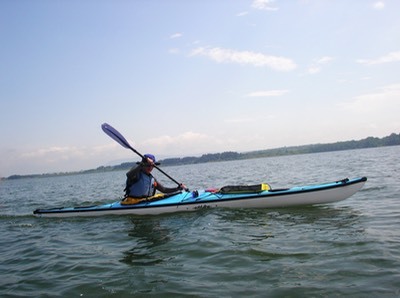 Our paddle strokes were out of sync and, like all new paddlers, we were only using our arm and chest muscles to propel the large boat and its load of gear toward our lunch destination. At lunch we learned that we had covered less than half of the distance we needed to travel before we could set up camp. We watched Hal and Elizabeth paddle. They seemed to paddle so easily compared to us, and with much less effort. 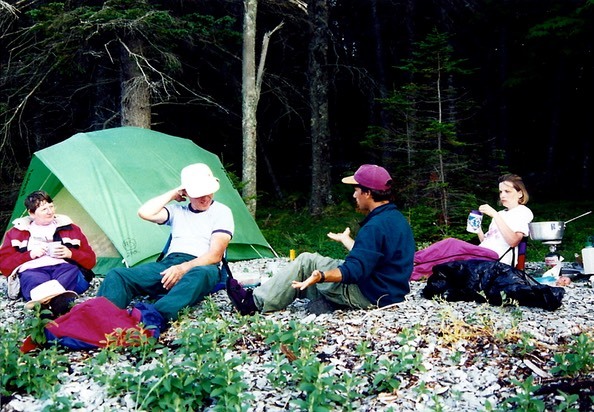 By the time we reached our first camp, our muscles burned. Camp brought new challenges. I’d been a car camper for years and had done some canoe camping as well. But a car carries a lot of gear, big gear, comfortable gear. 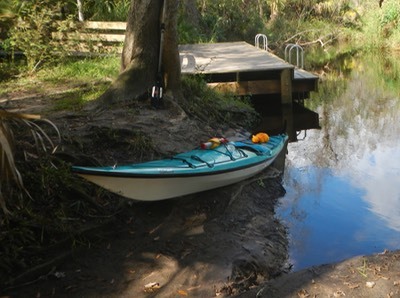 And a canoe is pick-up truck when compared with a kayak’s compact car size storage. So we set up our cozy two-person Timberline tent, spread out our foam pads and sleeping bags, pulled on warm clothing and relaxed in our Crazy Creek chairs while we waited for our guide to cook dinner. Camp also brought another new challenge – using a “cat hole”. There are no restrooms, outhouses or porta-potties on the Maine Islands. So when nature calls you grab the communal bathroom bag and head out somewhere to be alone. The bag contains a small shovel and some biodegradable toilet paper. We were told to find a spot below the high tide line to relieve ourselves. There’s not much privacy below the high tide line. You find your spot, dig your cat hole and squat like your pre-historic ancestors did, hoping nothing, human or animal finds you in your compromised position and that you don’t accidentally soil yourself in the process. Usually the only things that found you were gnats and mosquitoes. Elizabeth had her own way of letting us know she was answering nature’s call. She would take the bathroom bag and announce, “I’m going off to pick strawberries,” as she headed away from camp. We all picked this up as our code announcing that we wanted our privacy, thank you! The next day was wonderful. It was unusually warm and sunny for Maine, with enough wind and waves to make things exciting. We covered some 15 miles that day and were very sore by the time we arrived at our camp for the night. Lisa and I decide we wanted to wash up. I had brought soap that would wash us in salt water. So we headed around a bend in the island, out of sight of camp. The area was completely open with no cover whatsoever. We striped off our clothes and tried to get into the water. No way! The Atlantic in Maine stays at about 55 degrees in the summertime. We got in to where our ankles were covered, howling and hopping in pain from the cold water on our feet. Still, we managed to splash water on our bodies and lather up. But that meant we would need to rinse in that cold water. We managed to get rinsed off, dried ourselves and headed back to camp, feeling surprisingly refreshed. 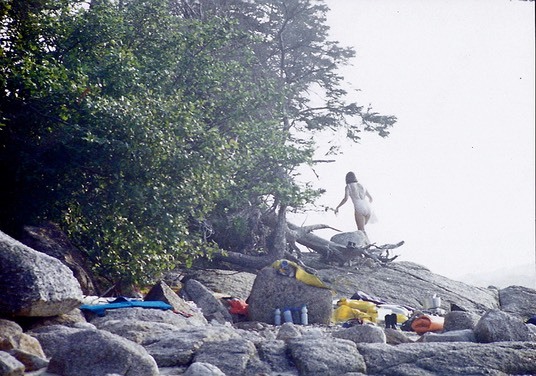 We boasted about how clean and fresh we felt, which prompted Hal and Elizabeth to follow our example and head off to our beach to wash. As they disappeared we noticed a lobster boat heading our way. It passed close by our island and very near to the beach where Hal and Elizabeth were standing naked in the freezing water with no place to hide. 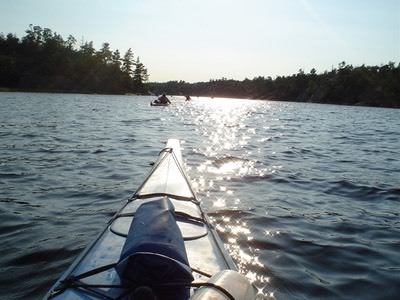 On our final day, our paddling improved significantly. We paddled into Bar Harbor with little pain, a sense of accomplishment and lots of stories to tell. 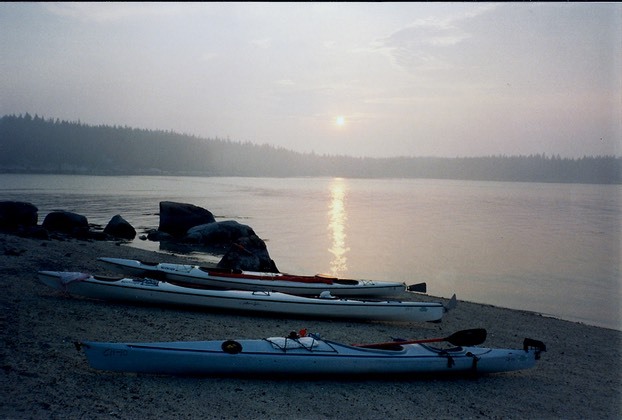 That evening we relaxed in the hot tub of our motel overlooking the harbor and knew we would be kayaking again.